As stated in the Salt Creek Watershed Network’s website, the Salt Creek watershed was once a “woodland, wetland, and riparian ecosystem”. 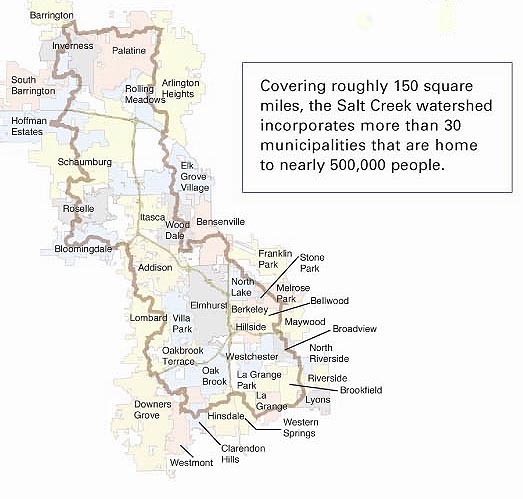 Today the Salt Creek Watershed “incorporates more than thirty municipalities that are home to nearly five hundred thousand people” (http://www.saltcreekwatershed.org). As a result, the landscape of the watershed has changed from natural filtration systems to impermeable landscapes that deflect clean water into flood zones and contaminated sewer systems.